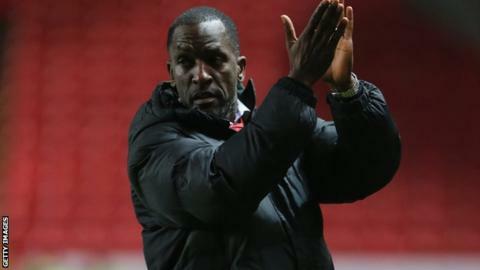 Charlton manager Chris Powell praised his side's attitude following their 2-0 win over Doncaster Rovers on Tuesday. The Addicks moved up to 17th in the table after what was just their second home win of the Championship campaign. "It was a really assured performance under some pressure as we lost the last two and haven't done particularly well at home," he told BBC London 94.9. "You look at the table and know it can move you up three or four places as it's so tight." Defeats by Leeds and QPR had left Charlton three points above the relegation zone but they moved six points clear of the bottom three after goals from Dale Stephens and Simon Church gave them victory at The Valley. "This game has always been hanging around after what happened with the abandoned game," Powell added. "We really showed our quality in a game where if we didn't take anything from it, it would have put a lot of pressure on us for Saturday. "We will still try and push on as we know what a result against Ipswich can do for us. We want to try and get back-to-back [wins] and it was important to bounce back after our last two games, which both ended in defeat." The win over Doncaster was Charlton's first at home since they beat Leicester 2-1 at the end of August. "I relaxed the boys and changed the side a bit," Powell said. "It was maybe the right game for us just to get our mentality right, in respect of creating chances and trying to take them. "The players were creative, we got the base again with the defence and I must give the keeper, Ben Alnwick, a special mention as we lost Ben Hamer in the warm-up. "He got his chance and, with not much time to think abut it, got a clean sheet. "It was really nice to get that winning feeling, especially at home."